Another side-scrolling platforming game made on the Unity engine, so, visually it’ll looks nice, but it’s not gonna stand out. Bland gameplay aside, the Alaskan Native history and folklore is the selling point behind this title. In conjunction with Cook Inlet Tribal Council, a non-profit organization that works with indigenous groups in Alaska, E-Line Media and Upper One Games developed Never Alone as a means to share and celebrate their native culture. Proceeds from the game will help fund the Council’s education programs. 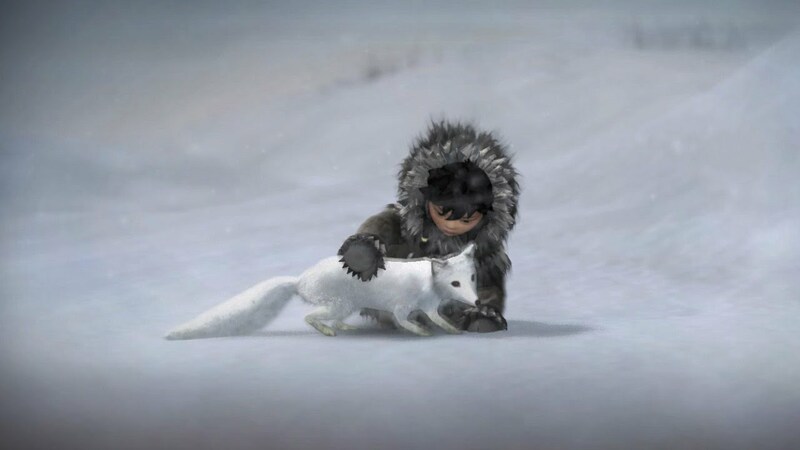 We, the player, play as Nuna, an Inupiaq girl, and her arctic fox. Played in single player, we have the ability to swap between the two characters, but Local Co-op is an option as well. The game is a side-scrolling puzzle platformer. Nuno has the ability to move crates, climb ladders and ropes, and throw her Bola to open new areas or fend off enemies. The arctic fox has the ability to scramble up walls, fit through low tunnels, or control the guiding spirits and trees for puzzle-centric gameplay. Alaskan Native history and folklore is the selling point behind this title. The story of the game takes place in the harsh Alaskan environments, during a constant blizzard. The wind itself plays a large role in the platform gameplay, as Nuna occasionally has to jump large gaps using the wind’s strength to propel her. The game is slow-paced and methodical, with few action sequences. The highlights being a few chase scenes, where Nuna and the fox must escape a polar bear, or a flame throwing enemy, but the core of the game has Nuna climbing up rock faces, riding spirit platforms, or going prone into the snow as the howling wind powers overhead. The game is broken up into 8 chapters, separated by beautifully illustrated cut-scenes telling the folklore story of The Blizzard Man, the Little People, the Manslayer, the Rolling Heads, and the Sky People. Also, unlocked through the gameplay and hidden collectables are education video insights to further our learning of these indigenous stories, and this is the motivation to keep you pressing on. The game has a message, but it’s short, and may even be overlooked and tuned out while worrying about making that next jump. It’s unfortunate. The game is narrated by a storyteller in the spoken Inupiaq language, and displayed as subtitles. It’s supposed to tell the tale of Nuna braving the Eternal Blizzard to save her village, but by game’s end, I felt like nothing was accomplished, save outsmarting and defeating a few enemies. 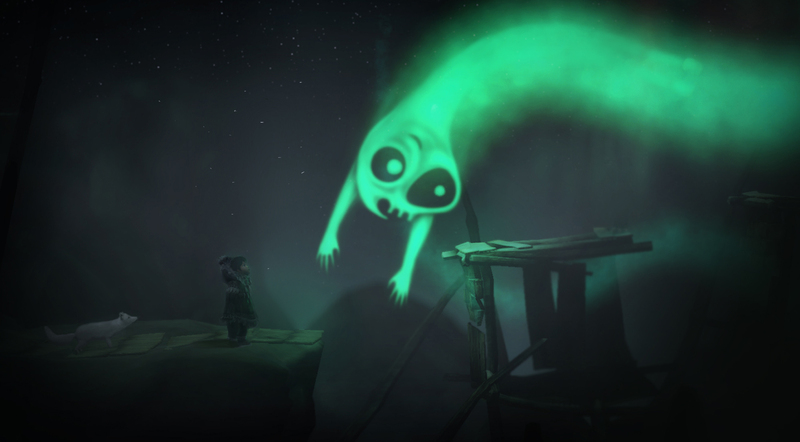 Never Alone is a charming game, with cute interactions between Nuna and the Fox. It has expansive environments that are simultaneously lovely, quiet, fierce, and ominous. The platforming is completely competent, and may have you laughing as a blast of wind flings your character face first into a wall, or groaning, as you jump too early and plummet into the chilly arctic waters. The fascinating video interviews are relegated to the menu, and you won’t really catch much of the story by playing the game. Maybe if played Alone, you’ll learn more. For those who like easy achievements, educational video games, and platforming foxes. This entry was posted in Reviews and tagged E-Line Media, Gaming, iRogan, Kisima Ingtchuna, Never Alone, Nuna, review, Upper One Games, Video Games. Bookmark the permalink. Platforming fox did it for me! Spot on review.